This is about Rota, Andalucia. If you have never been to Rota, then you have really missed out. Rota is beautifully situated right on the coast, in a part of the Costa de la Luz not yet very well known to the British. 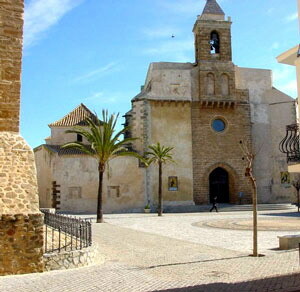 Rota started out its days as a tiny white fishing village and is steeped in history. It was originally founded by the Phoenicians at the same time as they founded Cadiz, the capital of this Province and it was originally called 'Astaroth'. When the Romans took over this part of Spain they changed the name to 'Speculum Rotae' and then when the Moors conquered, they changed it again to 'Rabita Rutta'. Now we are just known as Rota and have a town that is growing more and more attractive day by day. Rota has long been home to a Naval Base which the Spanish Navy shares with the Americans. When the base was founded in 1955 there were several thousand military personnel and only about 3,000 local inhabitants. Today however, this is the other way around and the town now boasts a population of some 27,000, whereas the military visitors only number around 2,500. In the summer the town becomes very busy with Spanish tourists who flock here for the beaches. Anyone who knows the Costa de la Luz will tell you that we have the best beaches in Spain and Rota is no exception, having some 16 kms of virgin sands covering two sides of the town. This is an ideal place for those looking to buy property somewhere typically Spanish. The only Europeans here are the few who venture in during the summer months. Rota still has a typical village atmosphere, yet it has the benefits of two international airports (Jerez and Sevilla), a couple of large cities (Jerez and Cadiz) and several golf courses all within an hours drive. There are no high rises here and nothing to crowd the waters edge, as on some parts of the Spanish coastline. Because of the building laws, nothing can be erected closer than 300 mtrs from the beach, nor more than 4 stories high. Here, even the new build retains a lot of its Moorish / Andalucian style and the town centre is still as it was when this was just a small fishing village. Rota is a promontory, almost a triangle, with a lively 'Puerto Deportivo' at it's tip. There are many bars and restaurants dotted around both in the old town, 'casco viejo' and the new. The northern side is bordered by 'La Costilla' and 'Punta Candor' beaches which extend from the residential area, through pine woods all the way to the Costa Ballena (a recently built, luxury golf resort) and on to the town of Chipiona. To the south, the beaches of 'El Rompidillo' and 'El Chorillo' run right along the edge of town to the navy base. Fuentebravia and El Puerto de Santa Maria are to be found just south of there. Not to be outdone by the rest of Cadiz, we also have many 'natural' areas such as the 'Parque Atlantico', the 'Parque del Mayeto' the 'La Almadraba' park and the 'Celestino Mulis' Botanical Gardens. Also noteworthy are our XVIth century Parish Church, 'Nuestra Senora de la O' and our XIIIth century Moslem 'Castillo de Luna'.